Grab your quarters and get ready to become a pinball (space) wizard. You may remember that Star Wars Pinball was released back in February as a three-table expansion to Zen Pinball 2. If you don't, no worries - the tables proved to be such a hit that Zen Studios got to work producing a standalone downloadable title with all the laser-guided nostalgia of the expansion. The muja fruits of their labor are now available to us in the form of Star Wars Pinball on the PlayStation 3 and Vita, with a handful of new content to set it apart. 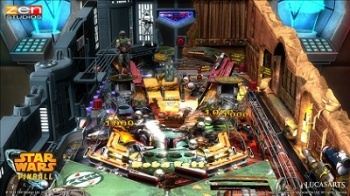 Star Wars Pinball offers the original three tables from the expansion pack: Star Wars Episode V: The Empire Strikes Back, Boba Fett, and Star Wars: The Clone Wars. The game takes advantage of Cross Play, so you'll be able to switch between your PlayStation and Vita versions at your leisure. Anyone who owns the Zen Pinball expansion will be able to download this standalone release free of charge to take advantage of its new features. What new and exciting features could they cram into a downloadable pinball game, you ask? You'd be surprised: Star Wars Pinball features an overarching campaign in which players enlist with either the Galactic Empire or the Rebel Alliance, with every point they score furthering the war effort of their chosen faction. The status of the Galactic Civil War will dynamically change the game's interface based on community actions. You'll also earn experience points as you play, allowing you to level up and gain ranks in the Empire or Rebel Alliance. That's not to mention the stereoscopic 3D, leaderboards, or varied multiplayer modes. This ain't your Master's pinball. If you've got the midi-chlorians for it, you can find Star Wars Pinball on PSN for the price of $9.99. That's 40 quarters' worth of pinball back at the arcade, and that version didn't have any of these newfangled XP progression systems.